It was only by God's Grace that Grace was rescued from a Monroe animal shelter on January 28th, 1999. I was about to leave the shelter when I noticed a gray glob of matted hair in the corner of a pen. An employee caught the dog and handed it to me. I could not feel its bony frame due to the thick matted hair, but it felt extremely light. 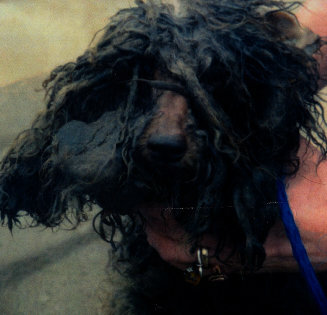 Its mouth was matted shut and had to raise its head to see due to the matted hair around its eyes. I took it to the nearest veterinarian. 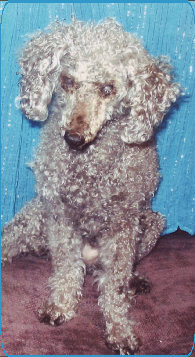 When the assistant finished shaving the dog we realized she was a female toy poodle. Most of her teeth fell out due to malnutrition and she weighed only 4½ lbs., less than half her ideal weight. I asked my daughter what would be a good name for this tiny bundle of courage. She said, "Let's name her Grace." I said "That's perfect because by God's Grace she was saved." After five days the clinic called me to come pick Grace up. She was very weak and had a slim chance of survival. The only thing left to do was love and encourage her to keep up the fight to live. She spent the next two weeks on a pillow in my closet. I left the door open and she gradually came out and explored the house. Her appetite started picking up and she began to feel safe. Grace now weighs 9½ lbs. and her confidence is building. It is apparent that she had been severely abused. She would not let you pet her around her face and ears, and she is terrified of anything around her neck. No one will ever know what Grace endured, but her courage has been the inspiration behind a permanent, loving home for neglected and abused animals, appropriately named Grace's Home. It was only due to her courage and will to survive that she became the catalyst for bringing animal welfare to the forefront of our community and state. 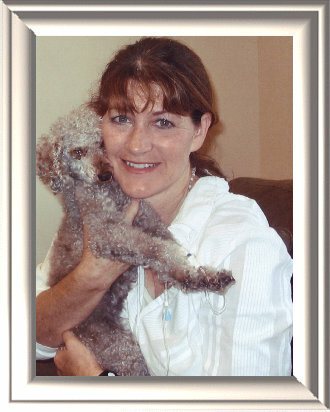 At 16 years old, her health began to deteriorate. Her kidneys were no longer functioning. Holding her frail body I could not force her to just “exist”; she would not eat or drink, she was being kept alive by a simple catheter In her tiny leg. I was now faced with making a very difficult decision. What would be best for my sweet Grace? Would I force her to suffer until the end or would I love her enough to let her go in peace. As I cuddled her, knowing that in minutes I would no longer feel her heart beating, she laid her face against my face. I could feel her warm breath against my cheek. I was then reminded just how delicate and precious life truly is. The total capacity of life itself can be determined by a minute measure of air as it is cycled throughout the vessel which we refer to as our body; and yet without it, what gives us strength, wisdom, and determination -- ceases to exist. I clung to these last few moments with her. What her life meant to me and to all the animals whose lives had been saved because of her courage, I truly did not want to let go of her. Her breathing became delayed as if to reassure me that it was ok – she would be ok – I had to love her enough to send her on to a better life and to be with those who have gone on before her. Hugging her, I softly spoke to her telling her repeatedly how much I loved her and how I was truly blessed to have had her in my life. 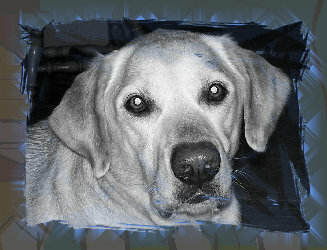 My precious Grace -- Until we meet again, you will remain in my heart forever!!! Her spirit will remain alive through our safe haven for abused and neglected animals which is named in her honor—GRACE’S HOME!!! Look around the website, we've updated and added lots of new things! Hope you enjoy! We are now accepting codes for Fresh Step Paw Points. Summer isn't the only thing starting! The expense for winter's hay is here. Grace's Home needs your help! Grace's Home traveled once again to the Houston SPCA with some of our rescued canines. Thanks to Bo Strange for lending his van to make the trip!!!! A special Thank You to Larry and Kathy Dage for donating the space for our Amazing Grace Boutique section in Southern Style Antiques. Even if you can only sponsor 1 bale ($4.00) that is one bale closer to the five hundred needed! Grace's Home is getting ready to purchase about 500 bales of hay for this Winter! 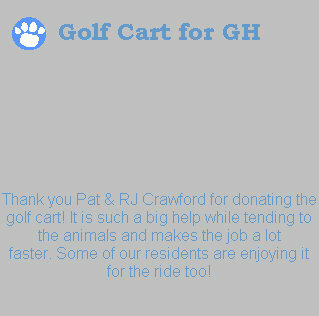 for providing a van to transport 12 animals to the Houston SPCA through the Grace's Home Houston Connection Program. They arrived safely and will soon be up for adoption to find a loving-forever home. 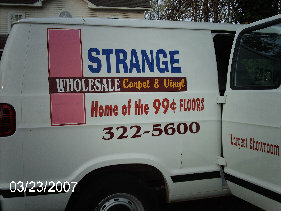 If you need any flooring products please go by Strange Wholesale Carpet and tell Bo Thank You for helping the 12 animals make it to Houston! Grace's Home would like to sincerely thank Joey Strong and Jeremy Young. Joey drove the crew in his truck to Houston and back without any sleep and paid for the gas expense. Jeremy loaned Grace's Home his new stock trailer for the long journey. Thanks to both these great men for making a difference to the animals!!! Grace's Home has a wildlife permit through the state of Louisiana. Over the years we have helped and released squirrels, raccoons, a variety of birds, and rabbits. These special creatures can only survive if we are there to help them through difficult times in their lives - injured or orphaned. The quickest, easiest way to contact us.